Charles M. "Mike" Harper, the project’s benefactor, is the retired chair and chief executive officer of ConAgra Foods and RJR Nabisco. 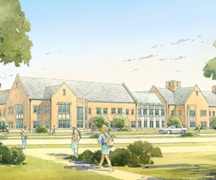 He made a $10 million gift to Notre Dame to support the construction of Harper Hall. The gift was matched with $10 million appropriated by the state of Indiana to Indiana University for the project. Harper’s gift is in memory of his late wife, Josie, who died of cancer. The new facility will be of similar design as Raclin-Carmichael Hall, which houses IUSM-SB and Notre Dame’s Keck Center for Transgene Research, and will connect on three levels with Raclin-Carmichael. It will include laboratories and offices for IUSM-SB and Notre Dame cancer research activities under the auspices of a new Mike and Josie Harper Cancer Research Institute. The ceremony will include an invocation and remarks by Notre Dame President Rev. John I. Jenkins, C.S.C., and remarks by Indiana University President Michael McRobbie; B. Patrick Bauer, speaker of the Indiana House of Representatives; Stephen B. Leapman, executive associate dean of education affairs at the Indiana University School of Medicine; Rudolph M . Navari, assistant dean and director of IUSM-SB; and Mike Harper. Born in Lansing, Mich., and raised in South Bend, Harper earned his bachelor’s degree in engineering from Purdue University, and his master of business administration degree from the University of Chicago. His professional career began at General Motors Corp., where he worked for five years as an engineer. He then spent 20 years working for Pillsbury Corp. in Minneapolis, leaving as group vice president responsible for poultry and food service businesses. When Harper became chief operating officer and executive vice president of ConAgra in 1974, the company’s annual sales totaled approximately $700 million. When he retired as chair and CEO in 1992, sales had increased to more than $20 billion, making ConAgra the nation’s second largest food company. Harper came out of retirement in 1993 to serve for three years as chair and CEO of RJR Nabisco. Harper previously established at Notre Dame the Lou Holtz Leadership Scholarship Endowment, earnings from which cover the majority of the costs of a senior at the University who exemplifies the qualities of a strong leader. He currently resides in Omaha, Neb., and has four grown children Mike Jr., Kathleen, Betsy and Carolyn who will join him at the ceremony. Originally published by William G. Gilroy and Mary Hardin at news.nd.edu on November 09, 2008.